I wish I could take credit for writing this, but it was sent to me by my friend George – who claims that he never reads! But he enjoyed reading this and enjoyed sharing it with his friends, and I’m going to do the same. We don’t know who wrote this, but those of you who read or know of Harlequin Romances will recognize the style immediately; and it’s a perfect rendering -- or, as I like to say, "It's spot on." If you’ve read this before, I hope you enjoy it again. Caution: Like all Harlequin Romances, this is Rated X ! He grasped me firmly, but gently, just above my elbow, and guided me into a room. Then he quietly shut the door and we were alone. He approached me soundlessly, from behind, and spoke close to my ear in a low, reassuring voice. Without warning, he reached down and I felt his strong, calloused hands start at my ankles, gently probing, and moving upward along my calves, slowly but steadily. I knew I should be afraid, but somehow, I didn’t care. His touch was so experienced, so sure. When his hands moved onto my thighs, I gave a slight shudder and I partly closed my eyes. I felt his knowing fingers caress my abdomen, my ribcage, my firm, full breasts. I inhaled sharply. Probing, searching, knowing what he wanted, he brought his hands to my shoulders, slid them down my tingling spine and into __________ [fill in the blank]. Although I knew nothing about this man, I felt oddly trusting and expectant. “This is a man.” I thought. “A man not used to taking ‘No’ for an answer. This is a man who would tell me what he wanted, a man who would look into my eyes and say…. As much as I hate to agree with Tolstoy (see: Would you believe,WAR AND PEACE? ), HAMLET has never been one of my favorite plays. Should he or shouldn’t he? But I’m always eager for an excuse to go to Manhattan, so I thought that a star-turn by a movie actor trying his hand at HAMLET was excuse enough. The play was in a fairly small theater which made it easy to see the actors’ faces, but I think the sets – mainly a dark bare stage with an occasional huge door or wall and the like – took away from the potential intimacy that this small theater afforded. On a grand scale, too, were the white lighting effects that swirled over the stage from time to time. This lighting, along with a dramatic musical accompaniment that foreshadowed the action – much as in a film – were a bit jarring. I wasn’t crazy about the costumes either, as it was all “modern” dress. Most wore black: black leather bomber-jackets, tight black jeans, gray tee shirts, and the like. I guess with the costumes, sets and lighting, the director was trying to make this a “current” tale. You know: “Hamlet is just like us.” (I don’t think so…!) In any case, it didn’t work for me – but then, I’m a sucker for costume dramas, so I may be a bit biased here. The acting, however, was very, very good. Some actors played several parts, and they so disappeared into their characters that you often didn’t notice that it was the same actor until you looked at the Playbill. 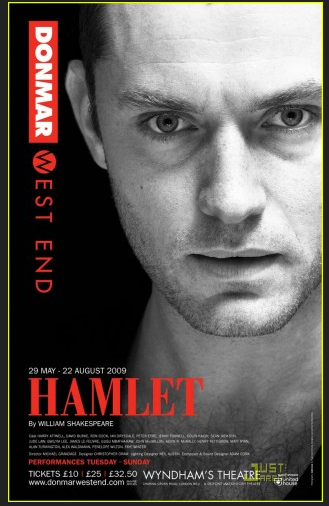 And Jude Law was brilliant: the best Hamlet I’d ever seen. His performance was very athletic, very physical – no moody Dane he! This Hamlet was bristling with a kinetic, manic energy; and he seemed ready to burst, to explode! One felt that from the first, he knew what he had to do; that from the first, he had decided to murder his father’s murderer – despite that this murderer was Claudius, his uncle and now stepfather. Throughout the play, it felt as though only the force of will prevented Hamlet from doing what he knew must be done. How can he make a widow of his mother yet again? How can he kill Claudius while he was engaged in prayer and thereby send the murderer’s soul straight to heaven? And in his delivery, Law also managed to find a tongue-in-cheek humor that really did make this Hamlet seem more “human” than most; and which also helped illuminate some of the self-deprecating undercurrents in the character’s thoughts. But most memorable was the sheer physicality of Jude law’s performance. He was all over the stage: sometimes flying like a dancer; sometimes squatting heavily on the floor as if to control himself, as if to hold himself back, hold himself down…. His hands, too: like a dancer’s. Every muscle, every movement, every gesture, told us something about this loving but tormented man. I loved this HAMLET – all 3 & ½ hours of it! Would you believe, WAR AND PEACE ? The question I was always asked when I said that I was reading WAR AND PEACE was, "Why?" And I think that's a most excellent question: why, indeed? I read in Hemingway's A MOVABLE FEAST that he'd considered it a great book; and as its style is so different from Hemingway's own, I wanted to see if I could figure out why. So now, 3973 pages later, I'm going to try to answer these questions! Let me begin by saying that I don’t think of WAR AND PEACE as a novel at all; and in that, I'm in good company, for Tolstoy himself didn’t think it was a novel and claimed that ANNA KARENINA was his first. In fact, the romantic stories of Natasha and Andrei and Pierre and Helene seem mere adornments to the book, an excuse to describe battles and to pontificate on philosophy: they are not "real" people, but mere personifications of Tolstoy’s philosophies. And he does not care about them, hastily discarding them once he has laboriously made his point. From the very beginning of the book, you know that to whomever else Natasha and Pierre may be engaged or married, they will wind up together: and they do. Pierre is in an unhappy marriage with the beautiful and much-admired, flirtatious Helene, and it is this unhappiness that leads him to wander about, ostensibly to learn the meaning of life. To that end, he joins various religious groups; tries social experiments on his serfs; engages in war; and “enjoys” heroism and poverty. And just as he finishes his "journey" by deciding that the purpose of life is to live it (!) he finds out that Helene has died. Suddenly. Without reason. In one passing sentence. If anything, it is a political and philosophical tract - and a needlessly long one at that! On the political side, it stands firmly against war and authority of any kind: neither kings nor generals nor organized religion have his respect. The best that he can say of them is that they are the products of circumstance; and often enough, he treats them with contempt. To illustrate these points, he spends many hundreds of pages describing in detail the battles fought between the Russians and the armies of Napoleon. The difference between victory and defeat is invariably attributed to the “chance” emotions and determination of the fighting forces: those foot soldiers on both sides who serve mainly as cannon fodder. Here – as throughout the book – Tolstoy explains, explains, explains as though he’s giving a geometry lesson: if this happens, then that must happen; if this is the cause, then what came before was the cause of the cause. And he does this over and over again — until he finally decides that we can’t really explain anything that happens because we are unable to go back far enough in our study of causes! Surely, he might have done better than that...! Of course the Communists liked Count Tolstoy: he was for ‘people-power’ – and the fact that they became the “Rulers” Tolstoy despised was easily ignored by them. Worse still, the cult of “equality” and self-abnegation which centered around Tolstoy ultimately played into the hands of Communist leaders. Andrei, for example, was a selfish man, ever bored and filled with discontent; then, by experiencing emotional and physical pain and by facing death, he is transformed into a loving, kind and soulful man. Pierre, too, is transformed by the difficulties he experienced and becomes more self-assured. He is even physically transformed: from a fat, hard-drinking oaf, to a charming and thin man who looks like…well, like Henry Fonda in the film, WAR AND PEACE! But the writing! Again and again, Tolstoy shows us how people - hundreds of people! - think and act; and then he explains it to us! There is no nuance – and no expectation that we might be able to interpret a person’s emotions, a leader’s behavior, the tragedy of a burned and looted city – on our own. Everything is explained in minute detail, as if to a child. Compare Tolstoy to Dickens. Dickens shows us the lives of individuals – even if some are drawn as caricatures – and we are allowed to draw our own conclusions about them, and about the reforms necessary to improve life in the England of his day. For me, when I substitute the name “Tolstoy” wherever the name “Shakespeare” was used or implied, I find that it describes exactly how I feel about Tolstoy and his writing…! English is not my first language, but it has become my only language; and from my earliest memories, it was books that made me feel that I was not a complete outsider in the world I inhabited. I might not wear the right kind of bobby-sox, I might not have a ponytail that would swing when I walked, but in books I found others – even American-born others! – who, like me, didn't quite fit in. The strong little girl in A TREE GROWS IN BROOKLYN would have liked me; I was sure of it! I was always a slow reader, which is a big handicap for someone who became an English Lit major! I remember that in fourth grade, we were tested to see in which reading group we would be placed the following year. The reading teacher sat at a table in the hallway outside of the classroom; one by one, we were called and given a passage to read. When she'd asked me to read, I was intent on not reading with a "foreign" accent, so I concentrated only on enunciating every word in perfect "American." For me, reading aloud and reading silently were two completely different activities: one was for sound, and one was for understanding. But I couldn't explain it to her, no matter how hard I tried. Happily, my family moved to another part of town that summer, and when at my new school they asked what "Reader" I'd been using, I said without a backward glance, SINGING WHEELS – the book I knew the “highest” reading group had been using! And I've been in the "highest" reading group ever since! But I remain a very slow reader. I read silently in the same way as I read aloud: enunciating in my head every single syllable, every "and" "or" and "but"...! While this careful reading can be an asset when reading complicated or technical works, it's really a burden when it comes to "light" reading, as they take me too long, and I notice things that are, perhaps, not meant to be noticed. My children are often frustrated with me when I read a thriller they'd loved and I say, "The character could not possibly have done this because on page 193 she said such-and-such..." They hadn't – and probably shouldn’t have! – noticed, and now I'd "spoiled it" for them. All this is by way of saying that I don't know how many books I'll be reading or writing about. I don't know the authors or the titles or the subjects I'll choose. I love fiction, but I also love to read biographies and histories. I like to picture myself in the skin of someone very "other." I'll read and post about books that I've read many times before – “old friends" who have something new to tell me each time I return to them – as well as books that I've never read, but have been recommended, or happen to catch my eye, or are just around: books with spines I know well, but with "insides" I know nothing about! And I'll also write about films and plays, old and new, which to me, are "books" that are read aloud, with that special quality that each story-teller inevitably adds when reading. It's why I love to see new versions of plays and movies I know well; to see them performed by a variety of players; to see if something new can be gleaned through this different performer or director, this different "reader." Unlike many blogs, my writing here is not meant to teach lessons, to stave off despair, to fill my time with something creative; it is not a "project" like a-book-a day, a-recipe-a-day. It is simply that I love to read, and I love to share what I read. Writing it down in such a way as to convey to others the book’s effect on me helps me to remember what I read and how I felt while I was reading. If, indeed, "the media is the message," it happens that I find it easier to write to someone – a letter, an email – than to write for myself alone. Were reading my musings to provide pleasure for others, then that would be better still. Hence: a blog.